We’d heard the forecast; we knew what we had to do. A couple of hours before the first snowflakes fell, we drove to the store and bought boots – at 50% off, which warmed the cockles of my bargain-loving heart. The price and fit were right; we didn’t inspect the soles. 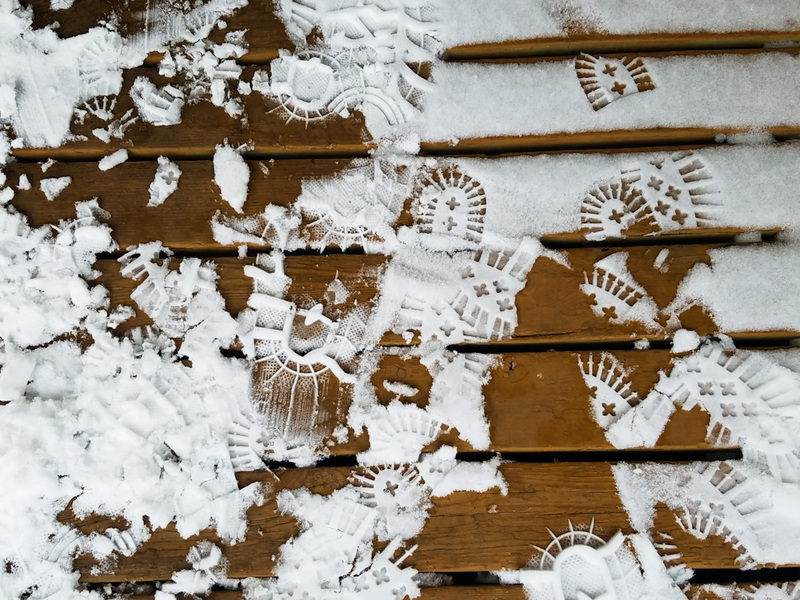 It was only when we came home from our first trek in the snow that I noticed the patterns on our porch and snapped the photo you see above. One of us was printing crosses in the snow, and I found to my delight that it was me! What a deep blessing it has been for me to invest my time listening to music and reading and thinking about Scripture that unrolls the story of Jesus. Several years ago I thought of a phrase that seemed to well describe how He lived His life. Each time I share this phrase I first say that I mean to do so reverently. I believe Jesus was Cross-eyed. As we follow Him through the gospels of Matthew, Mark, Luke, and John – and find Him in Old Testament prophecies and New Testament letters to the newly-formed churches – we see Jesus moving steadily forward, with the Cross always in view. Despite the devil’s daily barrage of temptation, He would not be distracted, detoured, diverted, detained, or delayed. He was Cross-eyed and mission-minded, and we were His mission. Look to Jesus, our source of joy, and be encouraged this week!